Nashvillians Dave Souksavath and Renee French relish a float along the Duck River in Bedford County. Their adventure began in quaint Normandy, home to Normandy Kayak Rental, the River Café, Petticoat Junction and the George Dickel Distillery. For those seeking a respite from the rat race, the Duck River and the River Café could be calling your name. Kayaking the Duck and dining at the River Café awaits you in the Bedford County community of Normandy, population 150. Also dandy for tourists is the George Dickel Distillery in nearby Cascade Hollow, and, for scrapbookers, the Victorian house christened Petticoat Junction. The river offers a home to more than 50 species of freshwater mussels and 151 species of fish and flows freely almost the entire 290 miles but for Normandy Dam and Reservoir near its source in Coffee County. “This is the Upper Duck. We have Normandy Dam, so it flows steady,” said Ridgeway, who has worked at Cumberland Transit in Nashville for 17 years where she specializes in footwear for cyclists, hikers and other outdoor enthusiasts. Their ’yak shack in town is but two miles from Normandy Lake. The 17-mile-long reservoir was finished in the 1970s and lures bass fisherman, campers and boaters. Normandy Dam, completed in 1976, rises 110 feet high and stretches 2,807 feet across the Duck River. Council recommends most weekenders to put their kayak in at Cortner Mill and float down to Three Forks Bridge, about a three-and-a-half-hour float, but they offer five different runs, ranging from 90 minutes to six hours. Into their third season, they are open weekends, but will go Friday through Mondays from Memorial Day through Labor Day, and will take groups on weekdays by reservations. Council and Ridgeway got into the kayaking rental business after the May 2010 flood washed over part of their backyard in Nashville. Not only is the business going swimmingly but there are fringe benefits in the form of friendly neighbors. “A great thing about this area is that it’s only five minutes to Tullahoma, but sitting here you think you’re in the middle of nowhere. It’s wonderful. The community watches over our stuff,” Ridgeway said. “There are lots of great places to stop along the river and picnic, a couple of little islands, but bring sunscreen, water and something to eat,” counsels Council. Regarding something to eat, visitors to Normandy should definitely plan to dine at Mitchell’s River Café & Mercantile, which nestles in a 1898 building that formerly housed a hardware store. Mitchell, a world-class aviatrix, has run the business affairs of the late, great country singer Waylon Jennings for decades, and now makes her home above the café where she also continues to run Waylon’s affairs for his family. She discovered Normandy via a friend, Celeste Krenz. “I told her about always wanted to live above my business some day. I had looked everywhere from Mexico to Moscow, and she told me about this place. As it turns out, it was for sale,” says Mitchell. Tops on the menu are meats straight off a smoking grill overseen by Mitchell’s brother Mike. While the River Café serves Saturday lunch and dinner and Sunday brunch, every Saturday night at 7, a top Nashville singer or band performs. That’s due to Mitchell’s connections with the music business. Miles and her husband have purchased the old Duck River Bank beside the café and are turning it into the Front Street Terrace, which will be available for special events. Next door to that, Mitchell is creating an open-air market that may serve as a farmers’ market and space for artisans to display their creations. Mitchell, Council, Kim Thrasher and the Music City Fly Girls, an all-woman fly-fishing club, team with Casting for Recovery, and this month will host 14 breast cancer patients to a retreat in Normandy and teach them to fly fish. The women will stay at Petticoat Junction, Bonnie Esslinger’s refurbished 1892 Victorian house in Normandy. This crafty girl’s dream generally is filled with guests who enjoy the place as a weekend scrapbook and spa getaway. The house holds four large bedrooms and can handle groups up to 15. The meals are catered, thus a leisurely time should be had by all. Also in Normandy, over in Cascade Hollow sits George Dickel’s Tennessee Whisky Distillery. Free tours of the distillery go from 9 a.m.-4 p.m. Tuesday through Saturday, except on holidays (last tour departs at 3:30 p.m.). Nashville merchant Dickel opened his distillery in 1870. His Tennessee sippin’ whisky is the only one to chill the whisky before it goes into the charcoal mellowing vats. The distillery was Tennessee’s largest before Prohibition shut it down. It was not until 1958 that master distiller Ralph Dupps rebuilt the distillery, and these days master distiller John Lunn oversees the operation. With a crystal clear stream, the overflow of Cascade Spring, flowing through the middle of the hollow, this proves to be one of the prettiest spots in Middle Tennessee. 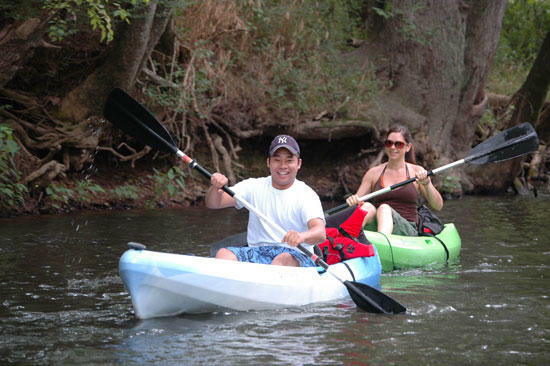 Normandy Kayak Rental provides kayaks for those who wish to float the Duck River. From Woodbury take Highway 70 west and turn left toward Bradyville. Continue past Bradyville to Beech Grove and drive beneath Interstate 24. Continue 7.3 miles to Potts Road (you will see a sign that says Deer Processing and Potts Strawberries during season ). Turn left onto Potts Road and go 2.3 miles to the end. Turn left onto Cortner Road and go 8.5 miles into Normandy. Turn left and cross the railroad tracks. The kayak shack is just to the left of the town square.